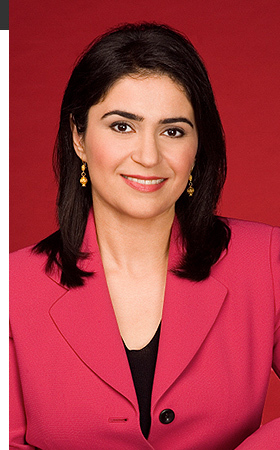 Parisa Khosravi is Senior Vice President for CNN Worldwide, in charge of Global Relations. As the first ever CNN ambassador, she is responsible for leading CNN's key international editorial relationships, coverage and securing access for CNN journalists around the world. She also manages International Newsource, the networks international affiliate operation with more than 200 CNN affiliates worldwide, and the CNN Journalism Fellowship programs. In addition, Khosravi oversees The CNN Freedom Project, the award-winning, multi-platform initiative that aims to expose the horrors of modern-day slavery and push for change, as well as numerous other CNN global initiatives such as girls education. A part of CNN for almost three decades, Khosravi previously served as CNNs senior vice president of international newsgathering with editorial, operational and administrative oversight of CNNs international bureaus and CNNs International Desk, which oversees the networks global coverage. Known for her passion and strong editorial instinct, Khosravi has played a vital role in the networks award-winning coverage of the most significant international stories since joining CNN just a few days after graduating from college. Some of those defining moments at CNN include the networks live coverage of the first Gulf War; the fall of the Berlin Wall; the end of apartheid; the show-down between protesters and the government in Chinas Tiananmen Square; and the genocide in Rwanda. She directed CNNs award-winning news coverage of the devastating earthquake in Haiti; the Emmy-nominated coverage of the attempted airline terror attack over Detroit on Christmas Day in 2009; and the duPont-winning coverage of the tsunami disaster in South Asia. For the last two and a half years, Khosravi coordinated CNNs distinctive, ongoing coverage of the unrest in Syria, prompting the Peabody Awards to honor the network this year for providing unmatched eyewitness documentation, analysis and context of the political unrest there. CNN has also received three Edward R. Murrow Awards and the Overseas Press Clubs David Kaplan Award for its coverage of Syria. In 2011, Khosravi led the networks Peabody and Emmy Award-winning coverage of the uprisings and conflicts throughout the Middle East and North Africa, including the revolutions in Libya, Tunisia and Egypt. In March 2011, she simultaneously led the networks ongoing coverage of the Arab Spring as well as the powerful earthquake and tsunami that struck Japan. The news coverage of these stories were simulcast across CNNs networks and platforms around the clock, including live broadcasts from Egypt under a difficult crackdown by the regime upon the media, and in close range of Japans Fukushima nuclear power plant as its reactors failed. She has been a leading force within the industry for incorporating user-generated content into newsgathering to bolster seasoned reporting, particularly from countries with limited or no press freedom. In her previous role, Khosravi orchestrated CNNs largest investment in international newsgathering in its history. She strategically increased the number of bureaus around the world, placing new operations in emerging global centers and in the Middle East, including in Kabul, Afghanistan; Sao Paulo, Brazil; Lagos, Nigeria; Nairobi, Kenya; Mumbai, India; Singapore; and Abu Dhabi, UAE. Khosravi also increased the number of correspondents throughout the world, including in existing bureaus in Tokyo, Japan; Istanbul, Turkey; Beijing, China; New Delhi, India; Islamabad, Pakistan; Johannesburg, South Africa; Abu Dhabi, UAE; Berlin, Germany; and added a senior Latin American affairs editor in Atlanta. Khosravis experience in safely leading CNN teams through conflicts and natural disasters has made her a recognized authority on these issues. She oversaw the safety and logistics of a CNN team who reported on the hotel terror attack in Mumbai. Because of her expertise, she serves as a board member for the International News Safety Institute. She also serves on the board for the International Womens Media Foundation, the highly-regarded board that strengthens the role of women in the news media worldwide. Khosravis work has brought her recognition and many prestigious awards for both individual and collaborative efforts. In 2008 she received the Ellis Island Medal of Honor, recognizing her as a distinguished American. Other notable awards include: Edward R. Murrow Award in 2007 for CNNs coverage of the Middle East Conflict; Peabody Award in 2005 for CNNs coverage of Hurricane Katrina and its Aftermath; duPont Award in 2005 for coverage of the Tsunami Disaster in South Asia; Peabody Award in 1992 for CNNs coverage of the attempted 1991 coup detat in the Soviet Union; Golden CableACE Award in 1993 for CNNs coverage of the Gulf War; Emmy Award and a Sigma Delta Chi Award in 1993 for CNNs 1992 Somalia coverage; a 1994 duPont Award for CNNs coverage of Bosnia; and the Overseas Press Club and duPont awards in 1995 for Crisis in Russia: CNNs Coverage of the Moscow Uprising; Edward R. Murrow Award in 2001 for CNNs coverage of Sierra Leone, CINE Award in 2003 for War in Iraq: Road to Baghdad, Overseas Press Club Award in 2002 for CNNs post 9/11 coverage and again in 2004 for Anatomy of a Raid. Khosravi earned a bachelors degree in broadcast journalism from Columbia College in Chicago and studied French at the Université de Sorbonne in Paris. She is fluent in Farsi.